September 2017 focused on water-soluble graphite materials! First up we included a full set of Derwent Graphitone pencils. 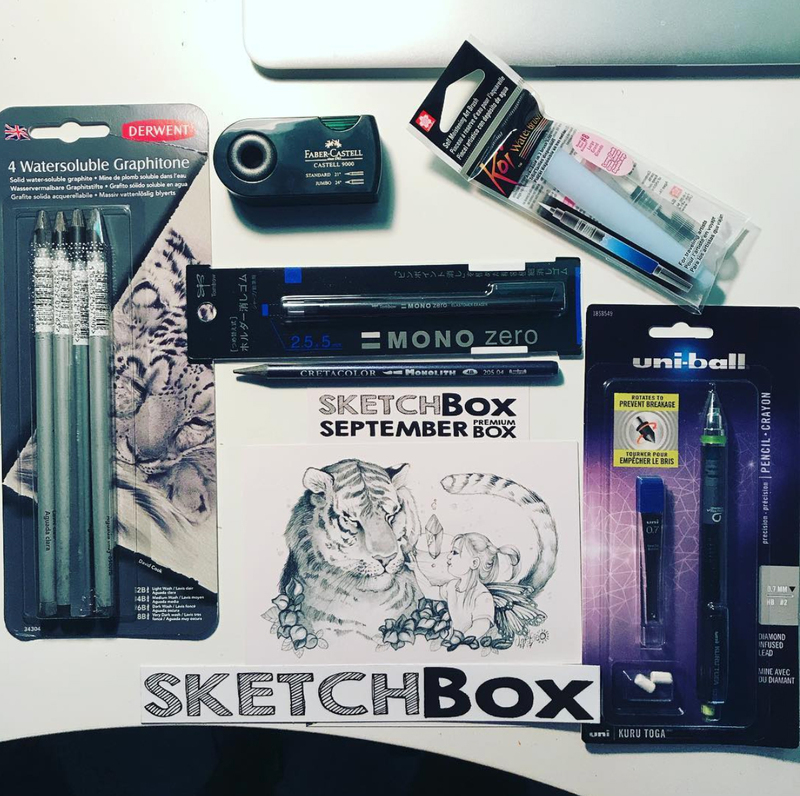 These solid graphite woodless pencils are water-soluble allowing for blending and unique watercolor style effects! Each can be used upright as a classic pencil or on its side for extended coverage. The set contains one each of four degrees: 8B, 4B, 2B and HB. Next up we included a Uni Kuru Toga mechanical pencil. As you use a regular mechanical pencil, the lead wears down on one side, forming a slanted wedge-shaped tip. Each time you put the lead to the page you end up using a different lead surface (pointy, flat, wide, thin) depending on how you hold the pencil. This can cause dramatic and unsightly variations in line thickness as you draw and sketch. This unique pencil has a special mechanism that rotates the lead with each click to make sure that you always have a pointed tip. Next up we included a large water brush from Sakura. This water brush has a large 9ml tank and a large round nylon brush head. Fill it with water and use it to blend your new graphite piece. It’s great for plein air work and fits in any pencil case with ease. Its large brush head allows for broad strokes or precise blending with a simple change in pressure. We also included a Cretacolor Monolith water-soluble pencil. This graphite pencil has the same thick 4B grade lead with thin lacquer coating as a Cretacolor Monolith Graphite pencil, but in a water-soluble form. It can be used wet or dry, on the point for details, or on the edge for shading large areas. Next up we included a Tomobow Mono Zero rectangle eraser. This pen style eraser features a retractable holder and a rectangular shape. Ideal for precise and broad erasing due to the shape of its tip. Use the corners for highlights and the full tip for broader areas. Finally we included a Faber-Castell 9000 sharpener. This double-hole sharpener fits easily in any pencil case. It can be used to sharpen standard graphite pencils with an angle of 21º and larger pencils with an angle of 24º for extra fine strokes. This sharpener has a removable waste container for quick, clean sharpening. This picture was taken by our subscriber @ms.meg.doodles on instagram!